Universal Display announced new warm-white OLED lighting panels that uses all-phosphorescent materials to achieve 58 lm/W and 30,000 lifetime (D70). This new panel is based on UDC's new light blue material system. This new panels offers a three times improvement in lifetime compared to just one year ago. The company is actually showing two new panels, both 15x15cm in size. The first has a color temperature of 2,580K, 58 lm/W, 30,000 hours of lifetime (D70) at 1,000cd/m2 and a CRI of 83. The second panel offers a color temperature of 2,950K and CRI of 82 - to achieve 62 lm/W. The second panel has 18,000 hours of lifetime (D70) at 1,000cd/m2. 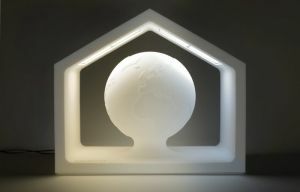 Shown above is UDC's new OLED lighting design (called the Earthouse) which highlights the ability for energy-efficient white OLEDs to emit different white colors. It uses an energy-efficient 3,000K white OLED on the left and a 5,000K white OLED on the right. Finally some efficiency - with 62 lm/W they're getting into the CFL range. 82 CRI is serviceable - but won't sway Incandescent/Halogen color purists. Rest of the spects are nice. So far so good. One iteration for some improvements here and there are all thats missing for mass production. If they can get the price down, of course.